After thirteen years of war minority communities in Iraq are now on the verge of disappearance, says a new report by Minority Rights Group International, Unrepresented Nations and Peoples Organization, Institute for International Law and Human Rights and No Peace Without Justice. ‘The Chilcot report needs to reflect not just the immediate circumstances of the invasion, but the devastating long-term consequences of the conflict for Iraqi society. The impact on minorities has been catastrophic. Saddam was terrible; the situation since is worse. Tens of thousands of minorities have been killed and millions have fled for their lives,’ says Mark Lattimer, MRG’s Executive Director. No Way Home: Iraq’s Minorities on the Verge of Disappearance documents how tens of thousands of persons belonging to Iraq’s ethnic and religious minorities have been murdered, maimed or abducted, including unknown numbers of women and girls forced into marriage or sexual enslavement, after the fall of Mosul in June 2014. According to the international rights organisations, the Christian population, which before 2003 numbered as many as 1.4 million, is now under 250,000. Most of the Yezidi and Kaka’i have been forced from their traditional lands and are now internally displaced or have fled the country altogether, whilst Shi’a Turkmen and Shabak have been driven to the south. In the most recent phase of the war Islamic State of Iraq and al Sham (ISIS) forces and commanders have committed war crimes, crimes against humanity and genocide. While Iraqi Security Forces, Popular Mobilization Units and Kurdish Peshmerga have also committed war crimes prohibited under international law. As ISIS swept through the Ninewa plains in the summer of 2014, the local population fled quickly. Latest reports indicate that approximately 3.4 million individuals, including over 1 million school-aged girls and boys, are now displaced, making Iraq the country with the highest number and fastest growing rate of people displaced in the world in 2015. Overall, the United Nations estimates that 10 million people have now been affected by displacement and are in need of humanitarian assistance. But minorities had suffered years of violent persecution before the ISIS advance, and two-thirds of the Christian population had already disappeared by early 2014. ‘Chilcot is expected to criticise ‘post-invasion planning’ but the UK government’s biggest – and continuing – mistake has been to support successive Iraqi governments since 2003 in a sectarian war that has cost tens of thousands of civilian lives on both sides,’ says Lattimer. Just over the last month, the assault on Fallujah by Iraqi Security Forces, supported by the international coalition, has resulted in over 80,000 further people displaced, and a wave of summary executions, torture and mutilation of corpses by government-allied militias. Many uprooted by the violence within Iraq hoped they would be able to return home within a relatively short timeframe. However, internally displaced persons interviewed by the rights organisations said that the lack of basic services and security in many locations mean that as many as one in five of them feel that they have no choice but to flee the country. The report makes key recommendations to alleviate the humanitarian crisis and prevent future human rights abuses, as well as making proposals on justice, reconciliation and asylum issues, and improving institutions and legislation. The report also says that the anticipated displacement from a possible effort to retake Mosul could total as many as 1 million over the next year, and the international community could witness the flight of hundreds of thousands of further refugees in 2016 alone. 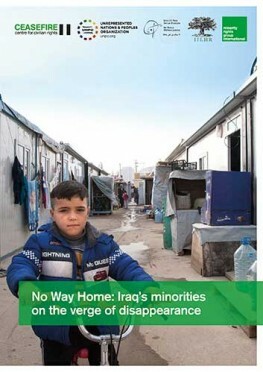 No Way Home: Iraq’s Minorities on the Verge of Disappearance is based on extensive interviews and field research, and is a follow-up report to Between the Millstones: The State of Iraq’s Minorities Since the Fall of Mosul, published in February 2015. It is the most recent in a long line of reports documenting the disappearance of the country’s minorities since the US-led invasion of 2003.